Durabuilt window and door systems are built to withstand extreme weather variation and meet the most stringent Energy Star requirements. 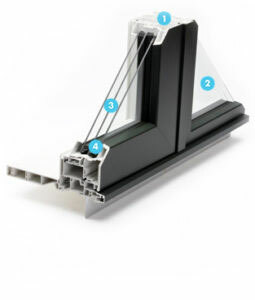 Not just one component makes our windows and doors energy efficient, but rather all of them work together as a cohesive unit, making our products the best in the industry. Fully extruded multi-chamber profiles provide barriers for cool air and moisture to enter the home. Low-E is a specialized window coating that acts as a virtual gate, permitting and deflecting solar energy. Triple pane windows improve comfort, help save on energy costs and reduce noise in the home. Durabuilt uses the premium all foam, no-metal Super Spacer ® in all our windows.